This is a very private location away from the hustle and bustle of town while also close to many restaurants and other activities. Unlike many other properties in the general area the dramatic scenery river frontage is amazing. There are many properties that have river frontage and fewer that own both sides of the river. Even fewer that have easy accessible usable land in an unmatched environment with excellent access and the land prices are still reasonable. You will quickly realize how amazing the natural beauty and how diverse recreational activities are in the area. The romantic nightlife, classy restaurants, river sports fishing, volcano viewing, local hot water springs, swimming, horseback riding, water sports on the nearby lake, bird watching, river rafting, jungle cruises, jungle canopy tours, butterfly farms, a wide diversity of plant life, world famous spas and hot springs. So, come and enjoy Costa Rica's irresistible tropical paradise. Own your own beautiful tropical coconut trees and tropical fruit trees. Consider building a home on this irresistible property. 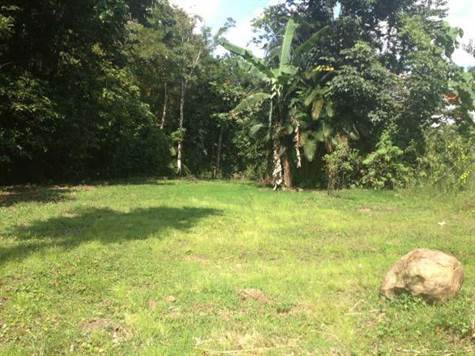 Located in the busiest tourist area of Costa Rica, this central yet secluded property could become a place for a beautiful private home that you design to your taste with wood available to harvest from your property , you could create your own Bed and Breakfast , create your own backpackers lodge , or even a wellness retreat. It is very well located on the main road and all the tourist attractions are within easy access. Maybe you dreamed of creating your own fishing paradise. There is ample area to build tilapia pools with natural gravity irrigation available from the river. If you are interested in farming this is also the property for you. This property is completely flat. This is a must see opportunity. Located approximately 15 minutes from the Central Park of La Fortuna, 25 minutes away from entrance Volcano Arenal National Park and a 30 minutes away from the lake Arenal, 3 hours to the International Airport, 3 hours to the Beaches .